Perfection is in this kit. 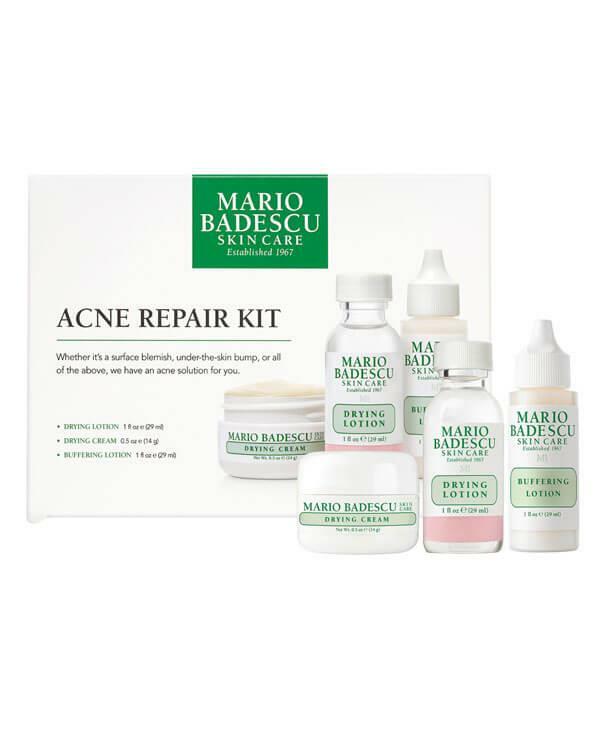 The perfect Acne Repair Kit from Mario Badescu is everything you need to get acne erupted skin looking clear and healthy is in this kit in full sizes. The world famous Drying Lotion clears up whiteheads overnights while the Drying Cream conceals blemishes as they heal, and Buffering Lotion helps fight larger areas of deep eruptions and helps prevent new acne before it starts. The individual price of these products together is €58,- but now you get the complete set for €48,-! Mario Badescu was a Romanian-born dermatologist with a bold vision. Being both a chemist and a cosmetologist, Mario had a very unique perspective about skin care, appreciating both the chemical nature and complexities of the skin, as well as the desire and innate satisfaction and confidence healthy, clean, radiant skin can give a person. Mario opened his salon in Manhattan, New York City in 1967, and began to develop his signature skin care product line. He brought his extensive knowledge of age-old, traditional skin care techniques to a whole new audience. The effectiveness of these products and his unparalleled European-style facials did not remain a secret for long, and soon Mario had drawn a loyal following of famous actors, actresses, and celebrities for whom skin care was important. True to their beliefs that everybody deserves good skin care, the brand offers effective, quality products at exceptional prices. Using simple, no-frills packaging is part of the reason they are able to do this because, at the end of the day, it’s the product inside that counts. It's an amazing product and does what it states it does, but I think depending on the skin etc, it works faster in some than in others. Would like that the kit brought more detailed instructions on how to use it (what product first, second, third, when exactly to use each, how long should you leave it, till when should you use it and how is the transition of the blemishes and pimples supposed to look like when using the product). I had to guide myself on almost all of this via videos on internet. Ik gebruik mario badescu al een aantal jaar en het blijft fijn spul. De drying lotion is geweldig, maar ook de andere twee producten kan ik niet zonder. De drying mask gebruik ik tevens als maskeerder voor puistjes. Werkt perfect! Fijne producten die voor mij echt werken. Kan eigenlijk niet meer zonder. Ik houd ervan! Ik heb al meer dan 15 jaar een problematische huid. Met kleine puitjes overal die nooit weggingen. Tot dit producten bundel. Voornamelijk de drying cream doet wonderen! Nooit gedacht dat ik zo snel resultaat zou zien. The drying cream was the most effective of the three products to treat my skin. I tend to get small underskin bumps, which turn into small pimples on my cheeks. The cream did avoid this process by using it every night, although it did not eliminate the bumps. I have also to say that I needed to take a break from using it, as my skin became really dry. The drying lotion was completely useless on reducing the size of pimples, and did not prevent at all their formation even if taken early. Finally, the buffering lotion was useful to calm my skin during heavy breakouts, but with the side effects of drying terribly the skin. So pleased with these products. The drying lotion was originally recommended to me, but seeing as my combination skin tends to result in under the skin (sometimes cystic) forehead and chin breakouts, I have found the other two products to be of use more often. The buffering lotion honestly reverses the progression of cystic acne if you apply it at the first signs, and the drying lotion is an easy way to reduce inflammation as well as conceal, so you can opt out of irritating makeup. I use it day and night, I can't live without the drying cream!